You’ve probably realized by now that we’ve got a 24 hour hackathon going on at COM1 Basement, on the 19th to 20th February (that’s this Sunday to Monday). We know that some of you can’t join for a number of reasons - either you’re too busy, or you’re not sure you can build an app in 24 hours, or you have other things you need to do. Time: 19 Feb (Sunday) 1pm - 20th Feb (Monday) 1pm Venue: COM1 Basement 1 Agenda: Bring your laptop, a programming project and some headphones! 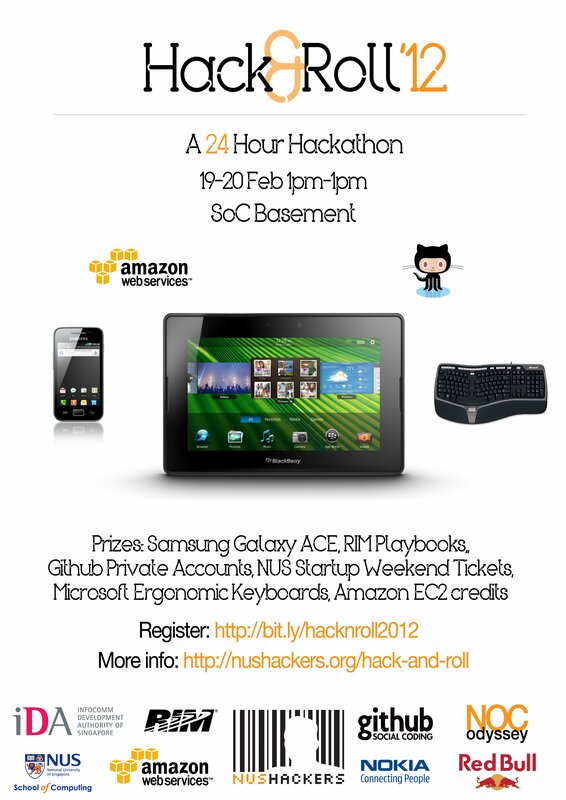 And if you’d like, do come down to meet the judges and watch the conclusion of the Hackathon on Monday, at 12pm. We will have Erwan Macé from Google, Sarim Aziz from RIM, Professor Lee Wee Sun from SoC (plus two other judges we’re awaiting confirmation from). (If you’d like to participate, you will have to pay the $10 registration fee to get a chance to compete for prizes. We have raised enough money for food now, thanks to the kindness of our supporting organizations: IDA and NOC Odyssey Fund; so we’ll be using the money from registrations to fund future Friday Hacks, for the benefit of the NUS developer community). We’re doing this because we want to have as many students as possible exposed to the idea that hacking is fun, is doable, and is beneficial for their future careers! So come join us!